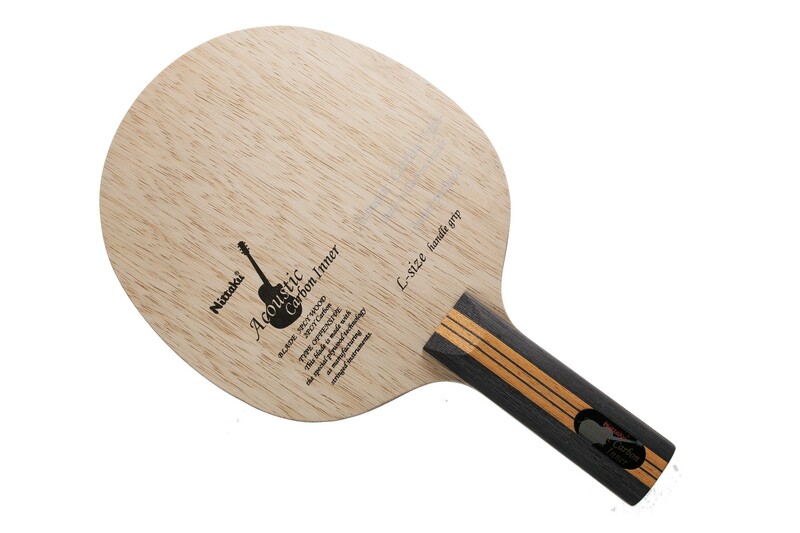 The Nittaku Acoustic is based on the original Acoustic Carbon Inner. This version has a larger handle which makes the blade heavier and thus slightly faster than the regular Nittaku Acoustic Carbon Inner blade. 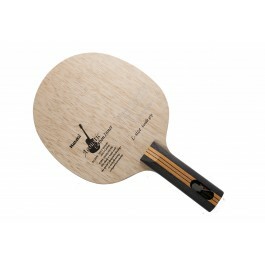 It could also be recommended for players who find the standard handle size is too thin. It was too fast for me.. It is very powerful and fine. It is fine and it is good to control. This is my first blade after a pre-made racket. what I noticed is that this blade has a very good and controllable short game and passive hits, the ball wont go flying away when you make short movements, i have read that this behavior is because of the carbon plies being closer to the core wood, and its nice. When you make the full swing, the carbon will make what it does better .... giving speed to the ball. The blade is very fast but not as fast as other carbon blades, so all in all, this is a great blade. What i don like of this blade is the handle, i made the mistake of choosing a ST large handle, because I had read that the non large version was too small... the result is that the handle is too large for my hand and it is not comfortable. If you have bigger hands, go for this (ST), otherwise i would recommend the normal version on ST, I cant say anything about the FL Large handle version . This blade is like a dream. The carbon layer is giving power, when needed. But the feel is there. It is like an all wood blade. And the "large" handle is not that large. İt is normal. 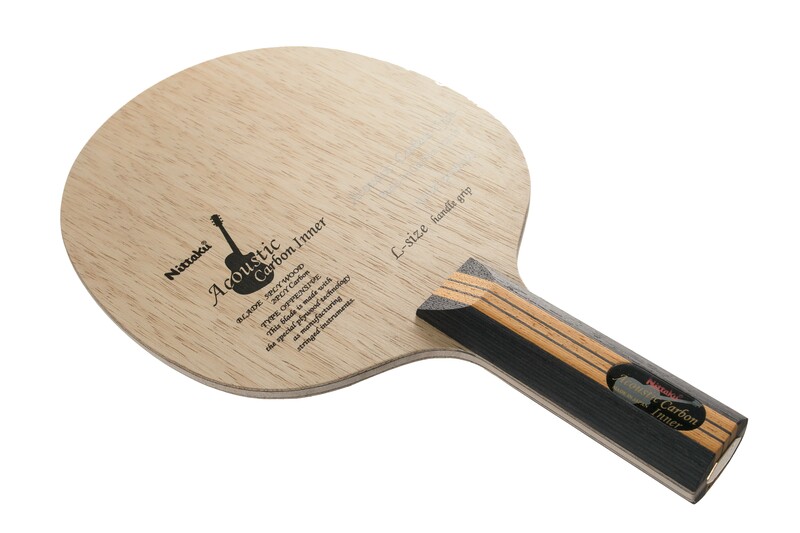 Alla ricerca di una Acoustic ho deciso di acquistare presso Tabletennis11 perché aveva la versione con il manico più grande. L'offerta della Carbon Inner era ad un prezzo decisamente allettante ed ho deciso di acquistarla. Dopo soli tre giorni l'avevo già in mano e, nella fretta di utilizzarla, ho montato delle gomme "avanzate" ancora sigillate che per poca convinzione non avevo messo su altri telai: Donic JP2 da 2mm sul rovescio e una Rakza 7 spessore max sul dritto. Nonostante la scelta obbligata direi che ho avuto fortuna: la combinazione è riuscita perfettamente. Ne è scaturita una racchetta che ha un controllo spaventoso, non eccessivamente veloce, ma che riesce a fare male sui colpi piatti decisi. Per quanto riguarda lo spin, ammetto di non essere molto bravo nei loop su palla tagliata, ma con questa Acoustic riesco dove con altri telai mi trovo in difficoltà. Rispetto alla BT Zhang Jike Arylate-Carbon che usavo fino ad ora e che posso arditamente definire simili, mi trovo molto meglio. Sarà per la scelta fortuita delle gomme o effettivamente perché con l'Acoustic ho un altro feeling, ma con quest'ultima riesco a sentire la palla e forzare senza timore. In definitiva, a parere mio, un'eccellente telaio.